Stokes Croft has quickly gained a reputation as Bristol’s cultural and artistic hub and taken on an identity of its own. Most businesses in Stokes Croft are independent, and place an emphasis on keeping it local and inclusive. Stokes Croft’s artistic atmosphere is characterised by its unique residents and of course, graffiti. Find out the top ten things to do and see in this trendy neighbourhood in one of England‘s, and the UK‘s, most exciting cities. Stokes Croft is best known for being a place to express art in all its forms, cinema being one of them. There are few better ways to escape than by delving into a good film. From cult classics to foreign films, Stokes Croft offers several spaces to watch independent art films. The Arts House Cinema is a space for just this, showcasing cinema screenings in their multi-purpose basement, along with live music, art exhibitions and more. In a similar vein, The Cube Microplex is a non-profit organisation that is organised as ‘a social art experiment existing in the form of a cinema and event venue’, and remains as one of the best cinemas in England. Unwind and get creative by watching an inspiring film at one of many venues in Stokes Croft. The Stokes Croft Museum is a unique one-room collection and ‘record of the recent past’ of the eclectic neighbourhood. Rather than a historical account of the area, this gallery is dedicated to paying tribute to the cultural quarter by displaying an assortment of items and compositions that showcase the essence of Stokes Croft. Doubling as headquarters of the People’s Republic of Stokes Croft, this museum aims to encourage street art, support the local economy, and promote an open and inclusive environment. To get to know the identity of Stokes Croft, head to this museum for an unusual type of cultural exhibition. Market at the Moon is your best bet for finding original and handcrafted everything This market is perfectly in line with the ethos of Stokes Croft, attracting independent traders, crafters and artists to buy and sell unique clothing, jewellery, furniture and more. Usually the first Saturday of the month, this pop-up market takes over one of Stokes Croft’s best bar venues during the daytime on the corner of Moon Street and is entirely a volunteer-led community project. Spend your Saturdays perusing upcycled accessories while snacking vegan or vegetarian treats available at the market, an incredible gathering of Bristol’s best independent businesses. 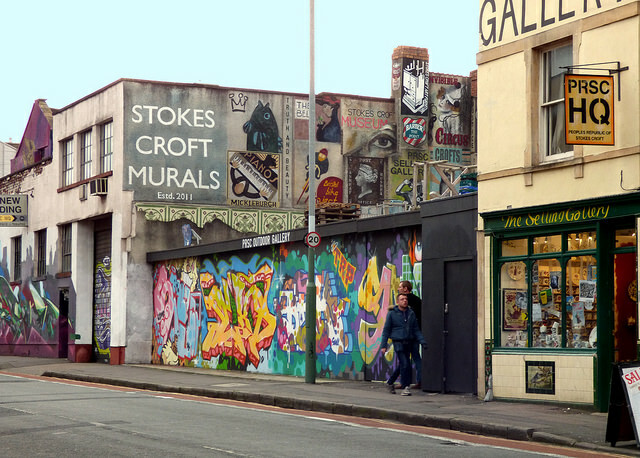 Arguably one of the top ten things to do in Bristol, going for a guided stroll in Stokes Croft is an experience in itself. The graffiti-clad walls and streets cover most buildings in the neighbourhood and are an integral part of the community. Decorating shops and abandoned buildings, you can find the work of famed graffiti artists such as Inkie and Banksy. Rather than vandalism, graffiti is a key form of self-expression for the residents of Stokes Croft. 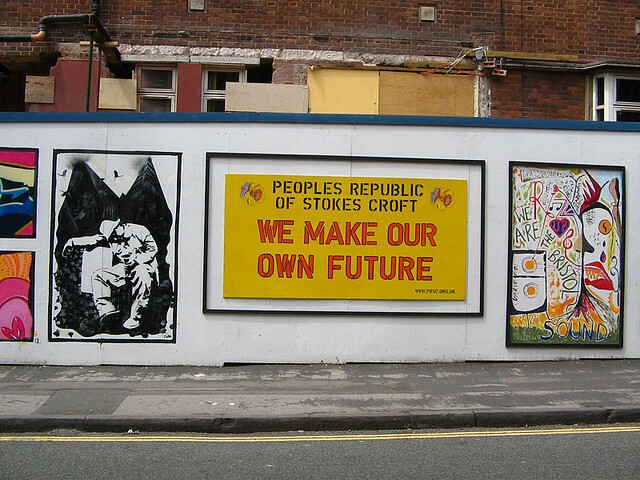 The People’s Republic of Stokes Croft, a community group, dedicates itself to protecting and promoting graffiti as a way of improving the streetscape of the neighbourhood which was previously dilapidated because of neglect. Some famous works include Banksy’s Well Hung Lover, and the Boycott Tesco graffiti project. It is commonly acknowledged that the nightlife in Bristol is second to none. It is no surprise that some of Bristol’s best clubs are right in the middle of Stokes Croft, the most creative and cultural hub in the city. Lakota Club burst onto the scene as one of the UK’s most famous clubs in the 1990s when raving became immensely popular. This massive three-storey venue often features internationally-renowned house, techno, drum ‘n’ bass and psychedelic trance DJs. 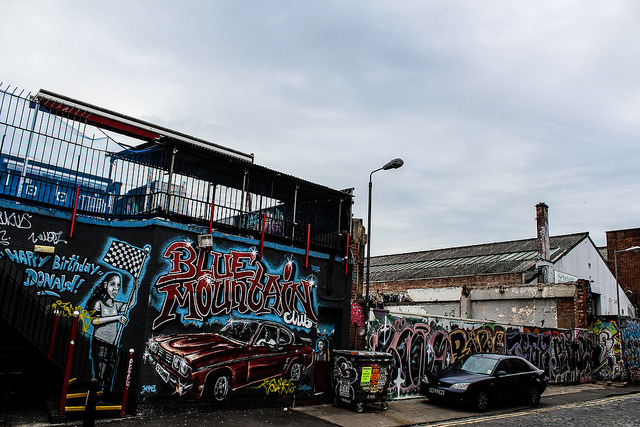 Blue Mountain is another long-established house of rave in Stokes Croft, dimly lit and grungy enough to create an atmosphere where underground music and ravers thrive. Any fan of underground music must spend a night at a club in Stokes Croft. If a heavy night of raving isn’t your ideal night out, the bar scene in Stokes Croft has many alternatives to offer. The Crofter’s Rights, one of the best bars in Stokes Croft, is famed for its jaw-dropping selection of craft beers from around the world, displayed on a large chalkboard upon entry to this restaurant and bar. This bar is regularly a host to live music events, showcasing local talent of all kinds of music and in keeping with the Stokes Croft community effort to think local. Unwind with a unique craft beer at this hip venue. The Stokes Croft neighbourhood has an incredible variety when it comes to a selection of what to eat. Most restaurants and food places in this neighbourhood are independent and place emphasis on sourcing local, fresh ingredients, as well as creating open and welcoming environments for all types of people. Often, venues double as art spaces for exhibitions, cinema screenings, and other events. Some of the best vegan and vegetarian goodies are to be found at the restaurants in Stokes Croft. In addition to this, the cultural diversity of the community creates a variety. Sample a Lebanese-Jamaican wrap at Biblos, or a transatlantic selection of pancakes from At The Well. Going shopping in Stokes Croft guarantees a good find. The creativity of residents of Stokes Croft shines through in a project led by the People’s Republic of Stokes Croft to create art furniture, using materials found on the street and old furniture headed for a landfill, ‘local artists working with materials found locally create a new aesthetic that clearly evokes the soul of Stokes Croft’. This assortment of quirky cupboards, coffee tables, lamps and more, range greatly in price, from pocket change to thousands of pounds. Whether you need a new bedside table or just fancy window-shopping, this is a unique Stokes Croft activity to experience. 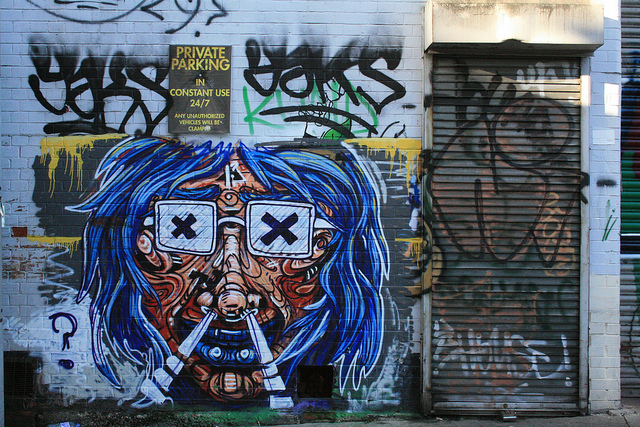 The See No Evil Gallery is a must-visit when in the Stokes Croft neighbourhood. With a collection of public artwork by multiple graffiti artists located around Nelson Street, this open-air gallery is Bristol’s answer to Berlin’s East Side Gallery. Its creation in 2011 was Europe‘s largest street art festival at the time and turned into a massive block party in true Stokes Croft fashion. In 2012, the See No Evil gallery was painted anew when the event was repeated. Before 2011, Nelson Street was ‘one of the most depressing, ugly and run down streets in Bristol’, but is now a cherished part of the community and captures the zeitgeist of Stokes Croft. 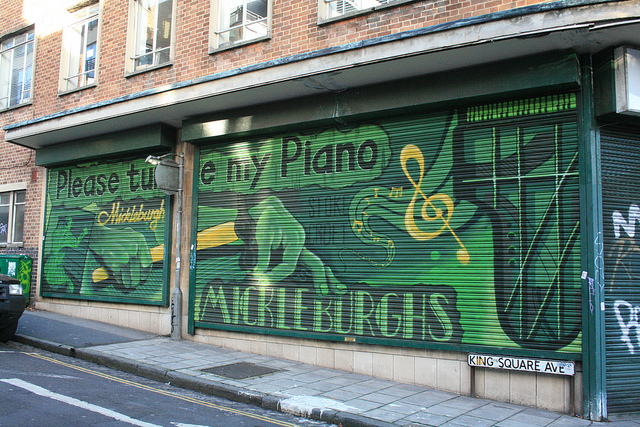 One of Britain’s oldest musical stores, Mickleburgh’s Musical Instruments has been on the corner of Stokes Croft since 1803. Originally a family business selling pianos, this independent music store has grown to an incredible size and offers a wide variety of services along with selling just about every instrument you can think of. Even if you aren’t gifted with musical talent yourself, this Stokes Croft institution is a worthwhile visit to browse through its musical maze in wonder.